Teacher/student ratio is approximately 1:9. Teachers carefully monitor student progress and catch issues early. At The Nysmith School, our goal is to make school fun for your child. Math is no different. Our math teachers are hired specifically to teach math. Each math teacher has a strong background in math and is passionate about inspiring your child to love math as well. We maintain a 1:9 teacher-student ratio and minimize both repetition in the classroom as well as homework. We want your child to love math. Part of instilling the love of math in your child is to find the appropriate math level. We take that responsibility seriously. We realize that every child has different abilities and aptitudes. Our math program is designed to allow your child the flexibility to progress to different levels if their math ability, maturity, study habits, and organization will allow them to be successful at higher levels. Our goal is not to race your child through math, but to find the correct level that will challenge but not frustrate them. One of the benefits of our 1:9 ratio is that we are able to work with the children daily and see how quickly they pick up information and relate it to previous lessons. The teacher then can easily assess when the students are able to progress. Class time is divided between spelling, reading fluency, comprehension, penmanship, and composition. Students may practice reading with both phonetic and whole language methods. Children may read up to four grade levels above their “base grade” – with no pressure to do so. Kindergarten: Emphasis on learning to read, basic spelling work, and introduction of cursive writing. 1st Grade: Emphasis on diversified reading curriculum, multiple spelling levels, chapter books, discussion groups, and cursive writing. 2nd Grade: Emphasis on elements of story composition and paragraph structure, multiple spelling levels, maximizing engagement, and penmanship. At The Nysmith School, we realize that children have a wide variety of skill sets in language arts. In some skills, your child may be working at grade level, in other areas, their skill set may be significantly more advanced. Nysmith teachers are flexible. We differentiate the skills being introduced to meet the different needs of your child in those skill sets. Children who may be voracious readers may be reluctant writers. We understand that. Our curriculum is designed to engage and motivate your child to do their personal best without feeling they are in competition with anyone else in the classroom. Each reading class has two teachers for 18 children to meet the needs of your child. The class time is broken down into spelling, reading fluency, comprehension, penmanship, and composition. Our reading is primarily a phonics-based program, however, we do use the language system for children who learn best using that method. The best analogy of the program is finding the shoe that fits. Reading levels are differentiated up to four grade levels without pressure. In kindergarten, some children are learning to read while others may be reading up to a second grade level within the class. Spelling levels will vary depending on the needs of your child. We introduce cursive handwriting with our fun approach in kindergarten, but we do not expect it. In first grade we continue our diversified reading curriculum to meet the needs of your child. We run multiple spelling levels. We introduce chapter books, discussion groups, as well as continuing to encourage cursive handwriting. Each hour and 15 minute language arts class is divided into 4 to 5 segments to engage and reset your child’s span of attention. In second grade, we build on the concepts introduced in first grade and begin to introduce the elements of story composition and paragraph structure. Spelling levels will range from second grade to as high as sixth grade. Again, the emphasis of the program is not to race through to a higher level, but to maximize engagement and help your child reach their potential. There are a variety of abilities in penmanship. We realize that some children have beautiful penmanship, others may not ever have beautiful penmanship. We understand. We help each child achieve the level where they will be successful. In third grade the children have multiple spelling levels. The children work on comprehension, fluency, and deeper analysis of the stories that they read. The readings are broken into historical, science fiction, fiction, and nonfiction. We grade your child independently to encourage them to work at the level that they are able to successfully accomplish. Kindergarten: Students are introduced to the life cycle of trees and plants, physical states of matter, weather, animals and animal classification, and chemistry. 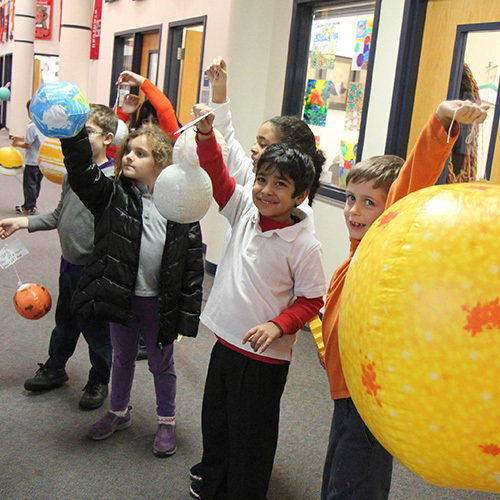 1st Grade: Students are introduced to scientific instruments, and learn about dinosaurs, bird migration, the solar system, insects, electricity, digestion, and nutrition. 2nd Grade: Children discuss the physics of rocketry, the Apollo, Gemini, and Mercury missions, the space shuttle missions, the life cycle of mealworms, the life cycle of bats, the human brain, scientific measurements, magnets, and “mystery powders.” They also study frogs, toads, coral reefs, and the rainforest ecosystem. 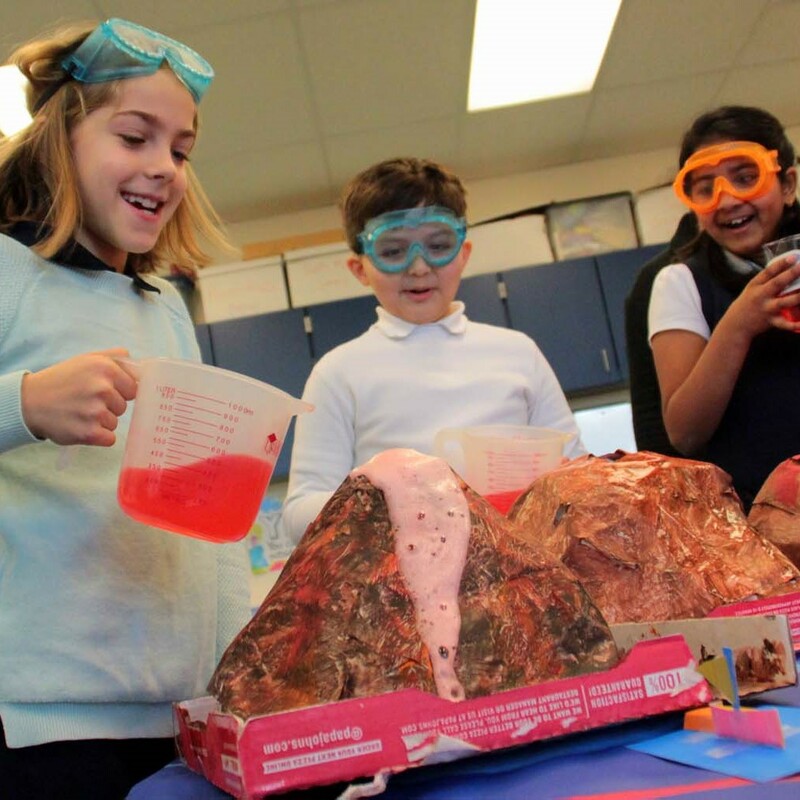 3rd Grade: Students work more deeply with the scientific method, units of measurement, earth patterns, the life processes of caves, geology, the life cycle of crickets, and simple and compound machines. They also create science fair projects at home. There are two teachers in each class of 18 children. 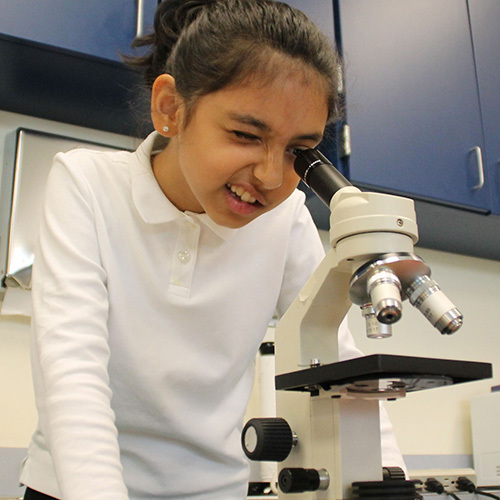 Every child from kindergarten through eighth grade has almost 4 hours of hands-on science each week. Two teachers in each class will help your child succeed, by facilitating the labs and directly engaging with your child’s exploration and discovery. The goal is not to prepare your child for specific science and technology high schools, but rather to excite and motivate them so that they see the great joy scientific exploration brings. And, through their Nysmith experiences, they see the variety of opportunities in science that are available to them in their future. Field trips help students see the variety of science done by real scientists in the real world. Students experience biology-related trips, visiting zoos, farms, the Chesapeake Bay, and arboretums,as well as trips to observatories to collect data. Guest speakers come regularly to discuss their fields and research, and The Nysmith School is an X-STEM School, affiliated with both the USA Science Festival and the Washington Executive Council (WEC), and hosts the WEC’s annual K-12 STEM Symposium. Many students who go on to attend Thomas Jefferson High School for Science and Technology mention that a substantial portion of their freshman biology course was introduced in their fifth-grade biology class at The Nysmith School. The biggest difference is that our approach to teaching science is very child-friendly. We are able to provide your child with a framework of knowledge and background that facilitates the finer details that your child will be introduced to in high school. In grades kindergarten through fourth grade, the year is divided into several units of study. The units of study are Earth Science, biology, chemistry, space science, and more. Beginning in fifth grade, the year is divided into the individual physical sciences. Our hands-on, living-history approach uses thoughtful and compassionate discussions to imagine and explore alternative historical solutions and paths. This holistic approach includes arts and crafts projects, dramatizations, cooking, music, and games. Students also role-play, debate, create maps, establish timelines, write skits, and take field trips. Kindergarten: Units of study are Geography, Native Americans, Colonial Americans, Mexico, Australia, and China. 1st Grade: Children study ancient Mesopotamia and Africa. They also study economics and business creation. 2nd Grade: Units include: Bartering and Money, Washington, DC, the Westward Expansion, the 50 States, US Presidents, and Ancient Egypt. 3rd Grade: Children study Geography, Ancient Greece, the early West African nation of Mali, the French and Indian War, the Revolutionary War, the Declaration of Independence, the Constitution, and the Bill of Rights. The Nysmith School specifically hires teachers who love history to teach your child social studies. We teach with a hands-on, living history perspective. The goal of the Nysmith social studies program is to instill in your child a love of history, help them recognize and respect different points of view, and increase their skill analyzing opinions and diverse texts. 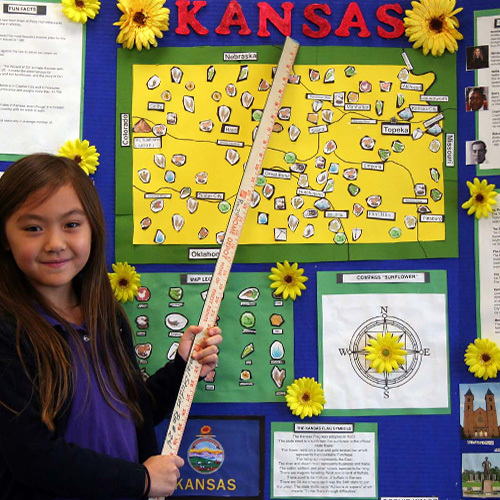 Each grade in social studies has several units that they study over the course of the year. They include a world history unit, an American history unit, and several shorter culture units. Nysmith social studies teachers employ many methods to help your child understand the complexities of human history. Students role play, debate, create maps, timelines, skits, and take many field trips, some local and some overnight field trips. Social studies teachers work with the art teachers to create art projects that reflect the units in social studies, so your child will see the impact art has had on history (and vice versa!). One of the benefits of The Nysmith School is that we do not spend a lot of time preparing your child for standardized testing. Instead, we are able to have thoughtful, intellectual, and compassionate discussions about many elements of social studies to fully explore alternative solutions, and imagine and probe alternative paths of history. This deeper thinking allows your child to more fully explore the human experience. The school also participates in the National Geography Bee and History Bee, as well as Model United Nations. Kindergarten: Introduction to Word, Excel, PowerPoint, and Kidspiration. Your children will produce projects tied to their other classes. Touch typing is taught to improve keyboard accuracy. 1st Grade: Your children will create a large number of projects tied to their core academic subjects. The projects include digital mind maps, science PowerPoint presentations, and science fair projects in Excel. 2nd Grade: As part of an overall study of the United States, students will research their individual states, and create travel brochures for them. They will also put together science fair presentations and collaborate with others on diverse projects related to both social studies and science. 3rd Grade: In support of their science program studies, students will make PowerPoint presentations that spell out their names in rocks and minerals. As part of their foreign language studies, they will research and make PowerPoint presentations about countries whose primary language is French. They will also learn to create restaurant reviews using Publisher. When many families think of The Nysmith School they immediately think of technology. There is a reason. We believe that technology offers a profound set of tools for your child to present their ideas not only more easily but also more effectively. The Nysmith School began integrating technology into the children’s daily curriculum when the school first began in September 1984. In those early days we used Commodore 64 computers. Technology has come a long way. Many Nysmith graduates that head to other private schools, many of them great and well known schools, comment that they are never introduced to the level of technology instruction in high school that they received at The Nysmith School. The reality is that we do not introduce technology to your child simply for exposure. We teach your child how technology can help them present their ideas in a multitude of different ways. We introduced your child to programming in a nurturing and caring environment so as to help your child succeed. Your child will not memorize code; we teach logical sequencing. There is a reason why the Nysmith robotics teams and Cyber Patriot teams have been so successful at the national level. By introducing your child early to the joys of technology, your child may find their calling in one of the facets of technology. A 1:9 ratio allows teachers to work independently with your child to help them succeed regardless of whether this is their first year at Nysmith or they have a profound interest in that area of technology. The classes are taught through the application of technology to solve problems, and create projects. With four separate technology labs in addition to a large media Center, six mobile carts, and classroom computers, The Nysmith School is able to facilitate technology to help your child succeed. Students are exposed to three languages in a semi-immersive environment. The goal of our foreign language program is to introduce your child to the joy of learning a foreign language in a fun, hands-on manner. We realize that children have many different abilities in foreign languages. Some Nysmith children are native speakers, some have an aptitude for foreign languages, and some children have difficulty hearing the nuances of a second language. We introduce your child to three languages in a semi-immersion process. Our goal is to develop in your child a love of languages, not necessarily fluency. With two teachers in each classroom, we are able to help your child be successful. Though our goal is to instill a love of language learning, our foreign language program is extremely strong. In seventh and eighth grade, our students take high school credit foreign language classes. Homework is minimal. Most high school foreign language classes require at least one hour of homework and evening to be successful but our program provides children with many of the same benefits at a fraction of the required homework time. Nysmith foreign language students work in small groups, with on hands-on projects for a deeper understanding of the foreign language. Elementary students are graded based on their motivation and effort in the foreign language classes. Our goal is for your child to be confident they can learn another language and for them to want to learn other languages. Other goals include building confidence, teaching musical note recognition, and encouraging music performance. Beginning in the third grade, students may participate in a strings orchestra, band, jazz band, chorus, and performance chorus. Some individual instrument tutoring is available after school. Kindergarten: Children perform on stage, incorporating different components of their academic studies. 1st Grade: Performances are now theme-based. Typical themes include famous Americans and the Thanksgiving play, which incorporates both musical and speaking parts. 2nd Grade: Students continue to work on their music reading skills. They also work on the Famous American performance piece. 3rd Grade: Formal instruction in theory, note recognition and music readings begins here. Additionally, students now perform in grade-wide musical productions. Students may join band, orchestra, or chorus. Beginning at age three, your child will have 30 minutes of music instruction twice a week. We realize that children have a variety of aptitudes and interests in music. We have students who have performed at Carnegie Hall and the Strathmore as well as children who have no interest in music at all. We have a variety of programs. In addition to the Nysmith School general music program, beginning in the third grade we have a strings orchestra, band, jazz band, chorus, and performance chorus as well. We also have limited individual instrument instruction tutoring after school. Nurture your child to love music. The Nysmith School general music program is a performing arts program. Each grade has a major performance each year. In the younger ages, ages three through kindergarten the children perform on the stage a variety of different components including social studies, music, French, science and more. Beginning with first grade, students’ performances are more theme-based. 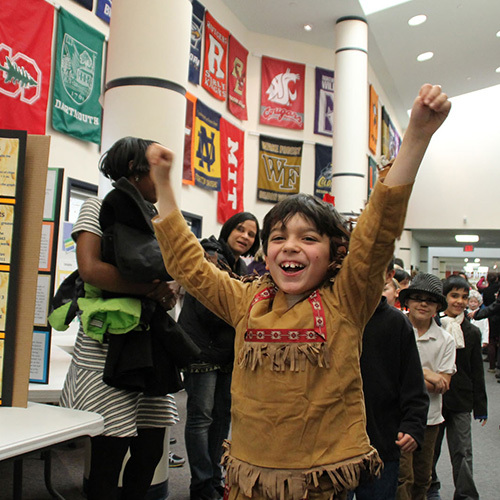 Typical themes include famous Americans, which ties together social studies and music, and the Thanksgiving play which includes both music and speaking parts. In third through fifth grades, students perform in grade-wide musical productions. Sixth graders usually perform a Broadway Junior show. We love seeing students develop confidence and leadership through these experiences! Nysmith knows that the academically gifted can also be athletic. However, for a variety of reasons, Nysmith has chosen not to offer its own competitive afterschool sports teams. Although many stereotypes exist that gifted children are not athletic, students at The Nysmith School break that mold. In the average classroom of 18 students it is estimated that 75% of the children participate in a sport outside of Nysmith. Of those 75% approximately 25% participate in either travel leagues or compete in the highest levels of competition in their sport. The Nysmith School does not believe in a lot of homework. The maximum amount of homework that the school believes in is 10 minutes per grade, 4-5 times a week. Therefore, a third grader should have about 30 minutes of homework 4-5 times a week. Without the tremendous volume of homework, your child can participate in activities outside of school that they enjoy. Whether that activity is a sport, musical instrument, or an academic passion, your child will have time to enjoy their childhood. The minimal homework also means that your child can devote a lot of time towards those endeavors. We have had students who have become professional athletes. We also have students that have no interest in sports whatsoever, and children with interests everywhere in between. At The Nysmith School, during the PE class, your child will be introduced to many different sports so that the children can get a sense of the rules and the skills required for the different sports so they get a chance to try them without committing for a full season. We introduce your child to a variety of sports including baseball, basketball, soccer, lacrosse, hockey, badminton, rock climbing, track and field, gymnastics, dance, and many others. The class begins with a quick activity that builds your child’s cardiovascular conditioning, a flexibility activity, and a strength building activity. Then your child will be introduced to different sports. We realize that some children have skill sets at a highly-competitive level in those sports as well as some children who have no knowledge of the sport at all. Our low student-to-teacher ratio allows us to work at a skill set that is appropriate for your child. We introduce sports in a friendly, collegial manner. We realize that this may mean that the children who play on highly competitive and aggressive teams outside of school may need to restrict the full set of skills that they would normally use on an opposing team outside of Nysmith. Some families have asked why The Nysmith School does not offer competitive afterschool sports teams. One reason is that in order to win in those inter-scholastic competitions, schools must have high-caliber and qualified coaches to be successful and those coaches require full-time employment. At Nysmith, we believe that the best-qualified teachers should be teaching your child academics in the classroom. We agree that there are exceptions, and there are some wonderful coaches who are great teachers, but we place a high value on placing the most qualified and enthusiastic teachers in each classroom. Music & Rhythmic Activities: The students will demonstrate moving to a rhythm, using basic rhythmic patterns.The students will practice locomotor skills while listening to different music. Movement & Body Awareness: The students will learn and review simple body parts and spatial awareness. Students will learn how to safely move in their own personal space. Throwing, Rolling, Bouncing, and Catching Skills: Students will practice different ways to throw and catch using various P.E. equipment by themselves, with partners, groups, and during station work. Striking & Kicking Skills: Students will learn to use various body parts and equipment for kicking and striking skills. Locomotor, Non-Manipulative, and Manipulative Skills: The students will demonstrate use of the movement concepts of directions, levels, pathways, and effort while performing locomotor skills. Running, Dodging, Jumping and Landing, Hopping, Skipping, Galloping, Leaping, etc. Stretching Techniques: Students will learn the proper way to stretch their muscles, the best time to stretch, and several different ways to stretch the major muscle groups. Simple Games: Tag, scooter, beanbag, scoops, kickball, tee-ball, running, jumping, cooperation, etc. Dance Introduction: The students will demonstrate moving to a rhythm by combining locomotor and non-locomotor skills to perform basic educational folk and creative dance sequences. Gymnastics: The students will demonstrate educational gymnastics sequences, including balance, roll, transfer of weight, and flight. Juggling: Students will learn how to juggle scarves and balls while listening to music. Rope Climbing & Fitness Development: The students will participate for short periods of time in moderate-to-vigorous physical activities that cause increased heart rate, breathing rate, and perspiration. Obstacle Courses & Stations: Students will continuously practice various sport and movement skills through the use of stations. Obstacle course work teaches agility skills and plymetric skills. Bouldering/Climbing Wall: Students will learn key vocabulary and techniques that will enhance their climbing skills. Students will improve balance, coordination, communication, teamwork skills, encouragement, motivation, perseverance, and fitness. Students will be guided though different movements, games, activities, problems and challenges to improve their climbing skills. Sportsmanship and Responsible Behavior: Students will demonstrate responsible personal and social behaviors in physical activity settings. Students will demonstrate good listening skills when learning procedures and receiving instruction. Students will demonstrate ability to share, and be cooperative and safe with others. Students will demonstrate independence and good use of time while practicing physical activity. Students will achieve and maintain a health-enhancing level of personal fitness. Students will understand why physical activity is good for health. Children gain confidence in creative expression as they discover their talents and abilities. Students have opportunities to display their work. 45 minutes once per week. In kindergarten the art class tie-ins begin with study of Native Americans in social studies. The children make pinch pots and learn several forms of weaving. In their study of China, the children create a scroll and a bamboo painting. In their study of Australia, the children learn the process of dot painting and will be introduced to pastels to create a portrait of an Australian animal. The children are also introduced to portraiture and learn how to draw each feature of the face. In first grade, the children make felt collages of physical features as well as a mixed-media self-portrait of a family ancestor. Water color paintings of animals symbolic of Mesopotamia are tied together with their ancient history unit. The students will make Senufo-style banners of African animals tied together with their Africa studies. In addition, the children make chalk pastel drawings of rain forest animals and create ceramic tea bowls. In second grade, the children learn how to make wire sculptures as well as use true watercolors in a painting. The children make a series of beads as part of their economics unit tie into the social studies unit of bartering. The students also learn to make a three-dimensional sculpture tied together with the study of monuments in Washington, D.C. For their geography tie-in, the children make a watercolor of their state bird as well as a ceramic tile of the state bird. For their study of Egypt the children make an amulet as well as a scarab. For the study of the American colonies the children learn calligraphy. In third grade, tied together with their study of ancient Greece, the children will make action figure drawings of other students dressed as ancient Greek athletes and use oil pastels to make landscapes of Greece. Also tied together with their Greek history unit, the children will sculpt ceramic reliefs of scenes from ancient Greek mythology, history or culture. The children will also make quilted paper designs inspired by Eastern European folk art tied together with their world history culture unit. With their American history unit the children will print an American pop-art style portrait of a founding father.